Update 18/11/2017: Tickets now on sale from the Epsom Playhouse here. 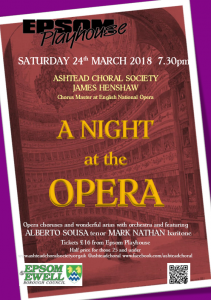 Ashtead Choral Society presents A Night at the Opera for your pleasure and enjoyment. Under the baton of its Musical Director, James Henshaw, the Chorus Master of the English National Opera, Ashtead Choral Society together with soloists Alberto Sousa and Mark Nathan, accompanied by an Orchestra, will present both well known grand choruses such as the Toreador’s Chorus from Carmen and the Chorus of the Hebrew Slaves, to more virtuoso pieces such as the famed Pearl Fishers’ Duet by Bizet. The Concert is taking place in the atmospheric main auditorium of the Epsom Playhouse, a venue itself for Opera productions, this gives a great local concert for opera and music lovers, whether coming for the first time or a long time supporter. Tickets £16 (Half price for those aged 25 & under) from Epsom Playhouse box office and ACS. Tickets on sale at the door until sold out.